Lisa's Djen Den: We Are Live! I can hardly believe my eyes! Yes, We are very excited! Still waiting on the kindle version, but won't be long now! Now we can finally get the book out to all of you who have waited patiently for this day. All of you are wonderful and I can't wait to hear what you think of the book! The novella will be out in the fall. We are about halfway through it. 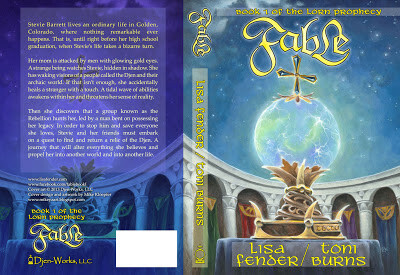 It will be called Book 1 of The Djenrye Chronicles - Fated. There will be a novella about the different races in between each of the novels. The second novel will be out next year. It's name is Lore - Book 2 of the Lorn Prophecy. Pretty soon we will be old pros! I will announce our launch parties in the coming days and the blog tour. I hope you can join in for some of these. There will be prizes and giveaways! Right now, we are basking and regrouping, trying to get our heads around finally being here. I will post the front, back and spine for all to see and I hope you can leave me a comment and let me know what you think. I really hope you like it and I hope you buy the book and enjoy it! For now, have a wonderful week and I look forward to your comments! Whoo hoo! I updated the link on my project list (http://tinyurl.com/cy2s2y9). I'm so excited for you! Thanks Susan and thanks for your friendship and support as well as your awesome editing! The book looks beautiful. How exciting for you! Congratulations. I've reserved the Friday June 7th date you requested for my blog. Thanks so much Lee! I will email you tomorrow! Thanks Jenna! I hope you bought your copy! Thanks again Ryan! You have been an asset and a good friend! finally signed on to your blog ! congrats again for Fable, would love to follow the blog tour...instructions welcome, as my daughters and son tell me I'm an internet moron...that's why my own blog is barely surviving ! have a wonderful day..pouring here in Toulouse today. Thanks Susan! I appreciate your signing up, it means a lot! As far as your blog, you need to pick at least one day a week and try really hard to post a new one every week. You will get there! I will be posting the dates and links for the blog tour hopefully Friday!